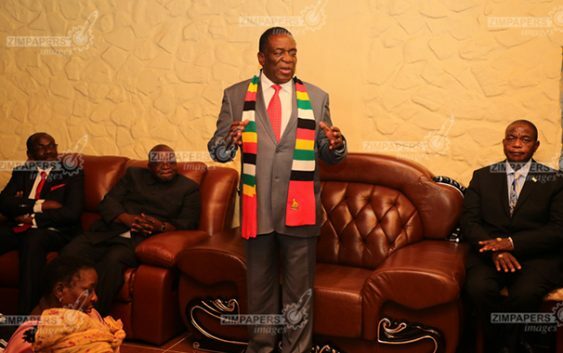 President Mnangagwa was reportedly Gogo Rushwaya’s brother.The funeral wake was attended by the all powerful delegation of Secretary for Defence and War Veterans Affairs Mr Martin Rushwaya, Vice Presidents Constantino Chiwenga and Kembo Mohadi, President Mnangagwa and Chief Secretary to the President and Cabinet Dr Misheck Sibanda, service chiefs and other high-ranking Government officials, because Gogo Mary Rushwaya (72) was mother to Secretary for Defence and War Veterans Affairs Mr Martin Rushwaya. Ms Henrietta Rushwaya paid tribute to her aunt Gogo Rushwaya, saying she was a woman of valour and a pillar of strength for the family. Today a memorial service for Gogo Rushwaya will be held at 10am at One Commando Barracks before the body is taken to the family plot in Hurban Park, Gweru. The body will lie in State at the plot and on Sunday the body will be returned to Harare, where it will lie in state ahead of the burial on Monday at Glen Forest. Mourners are gathered at Number 4 Glen Lorne Drive, in Glen Lorne. HeraldZanu PF has always been a family business. Remember Norton MP Temba Mliswa is President Mnangagwa’s nephew and interestingly enough Didymus Mutasa’s nephew,..you do the maths!